Are you a smoker? If yes, you are only putting your health and that of your loved ones in harm. Smoking is one of the common causes of various respiratory conditions, including lung cancer. If you want to be healthy, smoking is one of the bad habits that you should forgo. You surely do not want to be in a situation where you are already diagnosed with a severe respiratory condition after visiting a medical clinic in Guelph. To help you out, here are some techniques you can use. You must have the mindset and strong desire to quit this vice. The desire should come from you. If you are not ready to stop it, then nothing will happen. You should decide that now is the time to stop the very thing that is keeping you from being fully healthy. Do you find yourself needing to smoke after every meal? Try drinking a cup of tea, instead. Do you smoke during break time at work? Try stretching. Identify what triggers you to smoke and avoid it at all cost. Incorporate something that can help change your bad habit. The more you think about smoking, the stronger your urge to smoke is. The best way to prevent yourself from grabbing that stick is to keep your mind away from it. Do something that can keep you busy, like a hobby, meditation, watching a movie or chatting with family, friends, and loved ones. Enroll in a smoking cessation support program. Find a walk in clinic in Guelph, Canada that offers this particular program. 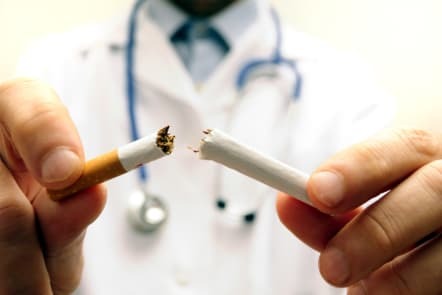 Through this program, a doctor can draft a treatment plan that will help you quit smoking the safest and most effective way, depending on your situation. Your doctor may suggest various alternatives to smoking such as eating candy, chewing gum or using nicotine patches which you can buy from a pharmacy in Guelph. Find an alternative that works best for you. Arkell Walk-In Clinic & Arkell Pharmacy is dedicated to helping you keep yourself and your family healthy. Visit our store or call us today to learn more about our services. This entry was posted in health care and tagged healthy family, healthy techniques, quit smoking. Bookmark the permalink.